Not too many years ago pillows were simple items that were either soft or hard. Today, with advances in technology pillows have become a sophisticated and complicated purchase. A good pillow can improve a user’s night sleep, prevent headaches and enable them to wake up refreshed and ready for the day. Instead of being weary, trying to find the right pillow, we have selected the best pillows on the market that will improve your nights rest and have you ready for all the challenges a new day brings. The Symphony Pillow is a softer Tempur-Pedic pillow that accommodates all sleeping types. The Symphony Pillow offers pressure relieving support combined with a soft plush feel of the softer pillow. The Tempur-Pedic Pillow supports the head and neck muscles allowing the neck and shoulder muscles to completely relax. The Tempur-Pedic pillow is recommended by over 25,000 medical professionals and is endorsed by the Arthritis Foundation. It is also one of consumer digests best buy picks. The Symphony Pillow has a gentle arch that provides support for the head and neck for back sleepers. Both sides provide pressure relieving support and comfort that accommodates side and stomach sleepers. The dual side design creates a pillow that accommodates all sleep types for a better rest. The Symphony Pillow responds to temperature and weight and conforms to the contours of the head and neck allowing for better relaxation and better sleep. It comes with a three year warranty. The Beyond down Gel Fiber Sleeper Pillow is stuffed with micro-denier gel fiber. This creates a pillow that is soft but has a firm structure to support the head and neck, enabling you to get a restful night sleep. The gel creates a cooler pillow that will help you stay cool throughout the night. 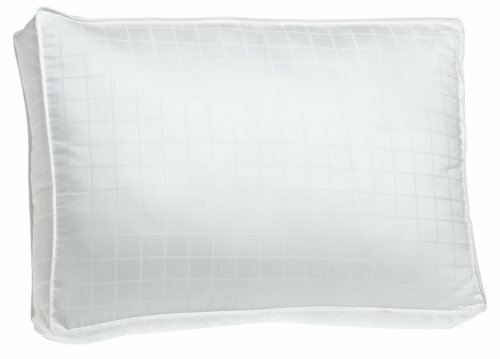 The Beyond down Gel Fiber Sleeper Pillow has a 300 thread count cover that is made of 100% cotton. The edges are double threaded and corded. The Gel Fiber Sleeper pillow cover is machine washable and hypo-allergenic. This synthetic down sleeper pillow offers a comfortable night sleep for back, side and stomach sleepers. The cool gel keeps the head cool for a sounder night sleep. The gentle pillow forms to your head and neck, yet has a firm center for support to provide a luxurious night sleep. The Beyond down Gel Fiber Sleeper Pillow will help you fall asleep quickly and stay asleep all night, waking up refreshed the next morning. 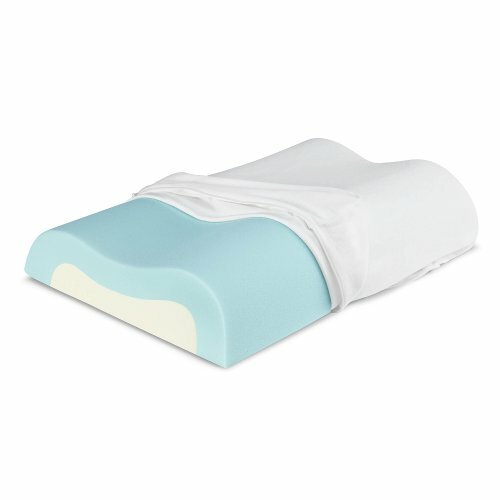 The Sleep Innovations Contour Memory Pillow has a two layer construction and design. The bottom layer is a firm memory foam support that will support the head, neck and shoulders for a better night’s sleep. The second layer is cooling memory foam that ensures a comfortable sleep temperature throughout the night. The Sleep-Innovations-Contour-Memory-Pillow retains its shape giving you continual support all night allowing you to wake up refreshed. It relieves neck shoulder and back pain by allowing the muscles to fully relax at night. The therapeutic benefit of the contour pillow is well tested. The Sleep Innovations contour pillow is built in an ergonomic shape to promote proper spinal alignment. This results in a more restful night sleep and less back and shoulder pain and less headaches. The Sleep-Innovations-Contour-Memory-Pillow has both a high and low loft to accommodate all sleepers’ preferences. 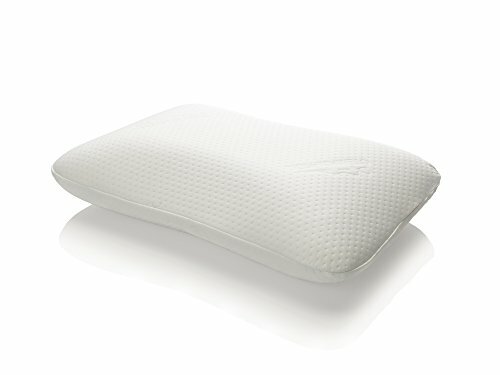 This Sleep Innovations pillow comes with a 5 year warranty and is made in the USA.